New Kitchen Cabinets help spring new life into an otherwise boring and dull kitchen. For homeowners in Seguin, Texas who only want to complete a small but significant home improvement project, new kitchen cabinets are a great idea. New kitchen cabinets are popular because they make a dramatic visual difference and can add more usability and convenience to your kitchen with a well thought out design. When it comes to choosing new kitchen cabinets there are several things you’ll need to consider in your planning. One of the most important things to keep in mind is your kitchen countertops because your new kitchen cabinets will be above and below your countertops. 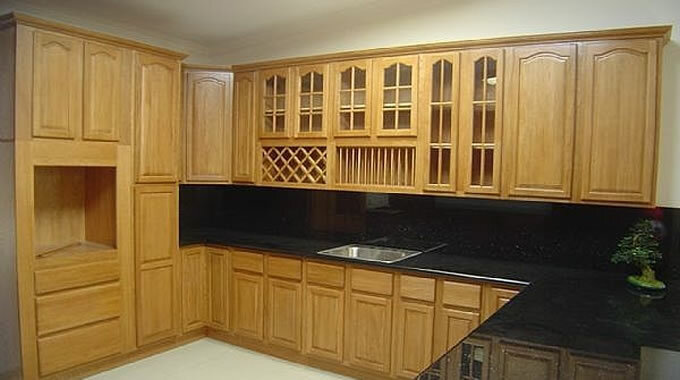 You want to choose kitchen cabinets that will compliment your existing decor. Another important aspect of your kitchen cabinet remodel is the layout. If you don’t plan your layout carefully you might end up with a kitchen you don’t enjoy using which is counter-productive to the entire kitchen remodeling process. What Types Of Kitchen Cabinets Are There? Stock Kitchen Cabinets – Often what you’ll find in homes that are located in subdivisions or developments because they are in ready supply. Stock cabinets can be acquired fairly inexpensively for builders and other home remodeling professionals which is why they are used so often. If you’re looking at doing an inexpensive remodel, or you’re working with a rental property then stock cabinets are probably the best choice for your kitchen cabinets. Semi-Custom Kitchen Cabinets – Semi-custom kitchen cabinets will have a set style and design but the actual width and height can be flexible along with some other options depending on manufacturer. If you have a custom kitchen, or appliances that need special consideration, then semi-custom kitchen cabinets are probably your best bet. Custom Kitchen Cabinets – Custom cabinets can be built with any sizing or style that you want. Obviously this is going to be your most expensive option but you’ll have total control over how your cabinetry looks and fits into your kitchen. If it’s in your budget custom kitchen cabinets will really set your kitchen apart from the norm. Transforming your current kitchen into your dream kitchen is what Lonestar Home Solutions does best. Your new kitchen will improve your quality of life and make your home more enjoyable. Not only that, but a professional kitchen remodeling job can make a great positive impact on the resale value of your home, too.